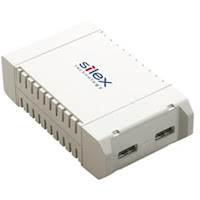 We're really excited to tell you about a technology that allows you to connect your existing USB or Serial dataloggers to your computer using an Ethernet connection. Basically, your dataloggers can be accessed from a computer anywhere across your company network. Depending on what logger you have and what software you're running, you can monitor all environmental and process measurements remotely! If you're using software, like HOBOware, you can use the 'remote' computer to send data across the Internet using ftp or email. The SX-3000GB allows you to connect up to 15 USB devices! So one computer can monitor 15 dataloggers from anywhere on your company's network. Connect a U12 with 4 channels and monitor 60 channels remotely! (Contact me to find out about connecting non-usb products). Silex products are used worldwide; we've tested the SX-3000GB with Onset HOBO's (U10, U12, U14, U30) , Dickson's TM320 and Squirrel SQ2010's and been very impressed with the results. You can even connect other USB devices such as: storage devices or usb monitors and connect remotely to them as well. From just £105, you can put your existing equipment to even better use and get even more out of it.